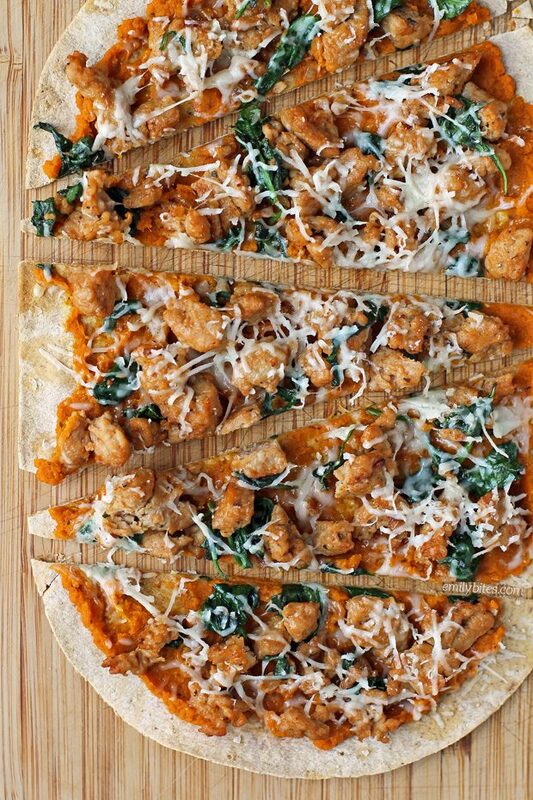 I have partnered with Flatout to create these Savory Sausage Pumpkin Flatbreads. I have been compensated for my time commitment to work with their product, however my opinions are entirely my own and I have not been paid to publish positive comments. 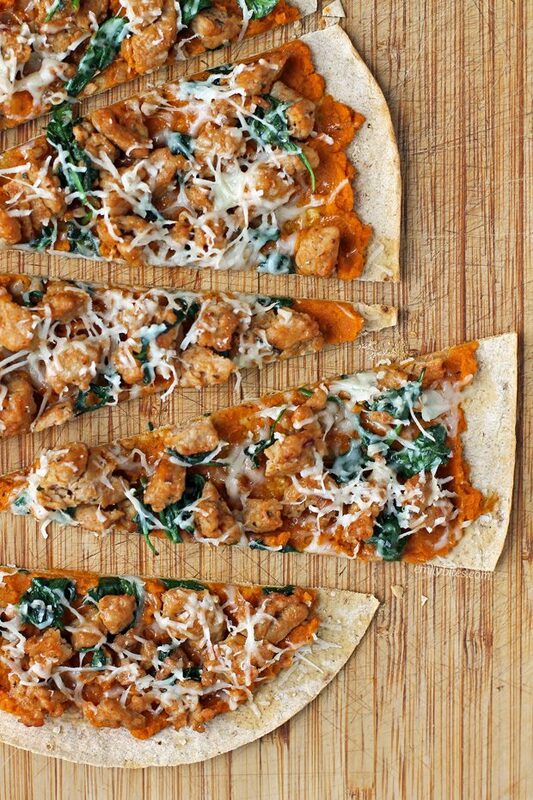 These Savory Sausage Pumpkin Flatbreads are absolutely perfect for Fall. If you’ve ever tried my super popular Pumpkin Alfredo Tortellini Skillet, I made this using similar flavors so you’re going to love it just as much. The creamy pumpkin with the thin, crispy flatbread, spicy sausage, sharp Parmesan cheese and flavorful herbs has me swooning. I like sweet pumpkin dishes and pumpkin spice flavored foods, but savory pumpkin recipes are what really get my taste buds excited. These flatbreads are also super fast and easy to make for a weeknight meal or weekend lunch, and each hearty flatbread is only 314 calories or 7 Weight Watchers SmartPoints! Serve these Sausage Pumpkin Flatbreads with a side salad for a healthy, satisfying meal that tastes impressive and comes together quickly. If you’ve been following me for a while, you probably know how much I adore working with Flatout flatbreads. 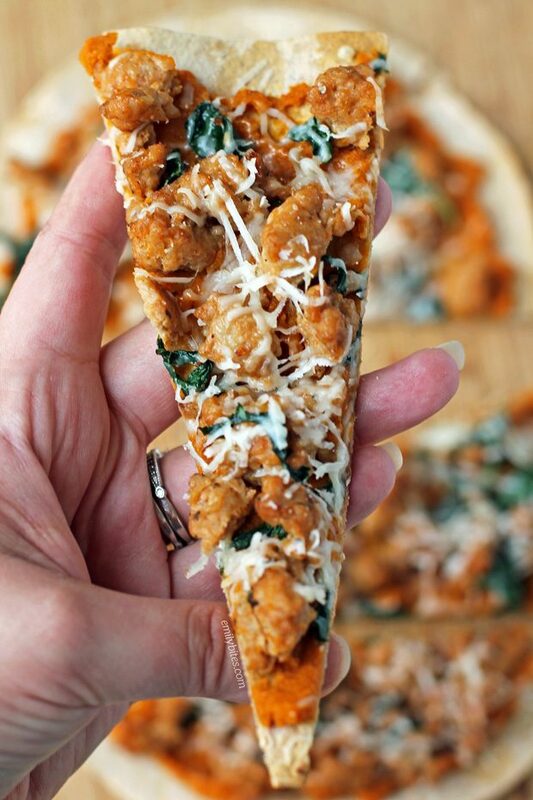 They make awesome thin, crispy pizzas (like this one! ), delicious wraps or perfect quesadillas. We always have some in our pantry and on nights when we end up without a dinner plan, we can always come up with toppings for a unique Flatout pizza or wrap. Flatouts taste great, they’re super versatile and they have a product to suit every need: low cal, low carb, high fiber, high protein – whatever you’re into! It’s easy to be creative and healthy when you’re starting with such an easy canvas. Want to see what other recipes I’ve made using Flatouts? Check out my Chicken Caesar Wraps, Veggie Lover’s Flatbread, Black and Blue Steak Wraps, Easy Taco Cups, Spicy Southwest Chicken Wraps, Peaches and Cream Dessert Flats, Three Cheese Mushroom Flatbreads, Maple Bacon Breakfast Wraps, Chicken Saltimbocca Sandwiches, Buffalo Chicken Pinwheel Wraps, Spinach Artichoke Flatbreads, Greek Snack Flats, Mexi Burgers with Guacamole, Chinese Chicken Wrap, Chicken Pesto Flatbreads and Bacon Cheeseburger Wraps! Lightly mist a small skillet with cooking spray and bring to medium heat. Add the sausage and cook, breaking it up into small pieces, until it begins to brown. Add the onions, garlic, sage and marjoram and cook, breaking up the meat and stirring regularly until the sausage is cooked through and the onions are translucent. Add the spinach and cook, stirring regularly, for another minute or two until the spinach is wilted. Remove from heat. Place the flatbreads directly onto the middle rack of the pre-heated oven and bake for about 3 ½ minutes until they stand firm when lifted. While the flatbreads are baking, place the pumpkin in a bowl and sprinkle with a pinch of salt and pepper, to taste. Stir and place in the microwave to cook on high for about 30 seconds. Remove the flatbreads from the oven and spread with the warmed pumpkin, leaving a bit of space around the edge for the crust. Divide the sausage mixture between the two flatbreads and spread across the pumpkin. Sprinkle the parmesan over the sausage mixture. Return the flatbread to the middle rack of the oven and bake for another 5 minutes until the cheese is melted and the edges are browned. Slice and serve immediately. That looks really good! Will have to try. Those flatbreads are SO versatile! I love making all kinds of pizzas with them. My favorite is a Mexican pizza with enchilada sauce, colby/jack cheese, black beans, corn, and ground beef. Omg this was SO good! Your recipes almost always work out to be delicious for me, and this was no different. Very sophisticated flavors. Thanks again!